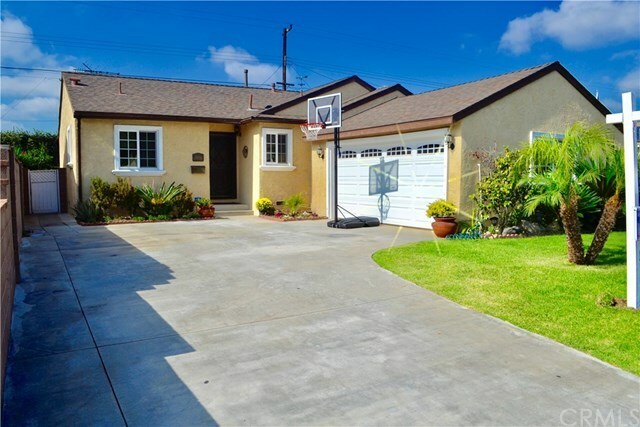 Located in the Lovely City of Downey, this house shows pride of ownership and is priced to sell. Features include: 3 bedrooms with great size closets, comfortable size living room, updated kitchen with recessed lighting, breakfast nook, granite counter tops, with plenty of storage cabinets. Great size dining area off kitchen that opens up to the rear patio when entertaining. 2 fully remodeled bathrooms with tiled shower walls, new cabinets, sink, fixtures and lighting, new laminate wood floors throughout, with new floor boards and crown molding throughout entertaining areas. New interior and exterior paint. Central heating and A/C. Water softener running throughout house. Laundry connections are inside the 2 car attached garage with newer door and automatic garage door opener. Windows, roof, electrical and plumbing have been update throughout the years. Great size enclosed backyard with a covered patio over a tiled slab, with a side grassy area, perfect for entertaining friends and family. This property feels and shows well.